KIEV, Ukraine (RNS) — The Rev. Andriy Lototskiy faced perhaps the toughest decision in his life: He had to choose between his faith and his flock. In 2014, Lototskiy had been preaching for 14 years at the Church of St. Volodymyr in the small village of Strilche in western Ukraine. That summer, as pro-Russian separatists in eastern Ukraine sought independence from the central government in Kiev, his parishioners turned against him and demanded he surrender the keys to his church. There was nothing wrong with his preaching. It was what he represented. Lototskiy was a priest in the Ukrainian Orthodox Church, the largest faith community in the former Soviet republic. The problem was that his church was affiliated with the Russian Orthodox Church and pledged loyalty to its primate, Patriarch Kirill of Moscow. His congregants had decided to join a wave of believers who had switched to an alternative, Kiev-based Ukrainian Orthodox Church after it was founded in 1992. In Ukraine, some 70 percent of the population identifies as Eastern Orthodox Christians. Among believers, the rest mostly belong to the Ukrainian Greek Catholic Church, the Roman Catholic Church or various Protestant churches. The original Ukrainian Orthodox Church has been subordinate to Moscow since the 17th century, even before Ukraine was made part of the Russian Empire. The relationship continued after the country broke away from the Soviet Union. But those ties started to cause problems in 2014, when Russia annexed Ukraine’s territory in Crimea and instigated an ongoing armed conflict in eastern Ukraine that has claimed more than 10,000 lives. Moscow’s meddling occurred after President Viktor Yanukovych, an ally of Russian President Vladimir Putin, fled the country in February 2014 following a groundswell of protests against his corrupt rule. Now many Orthodox parishioners in Ukraine are distancing themselves from the Russian-backed church, whose hierarchs are a key pillar of support for Putin’s policies. 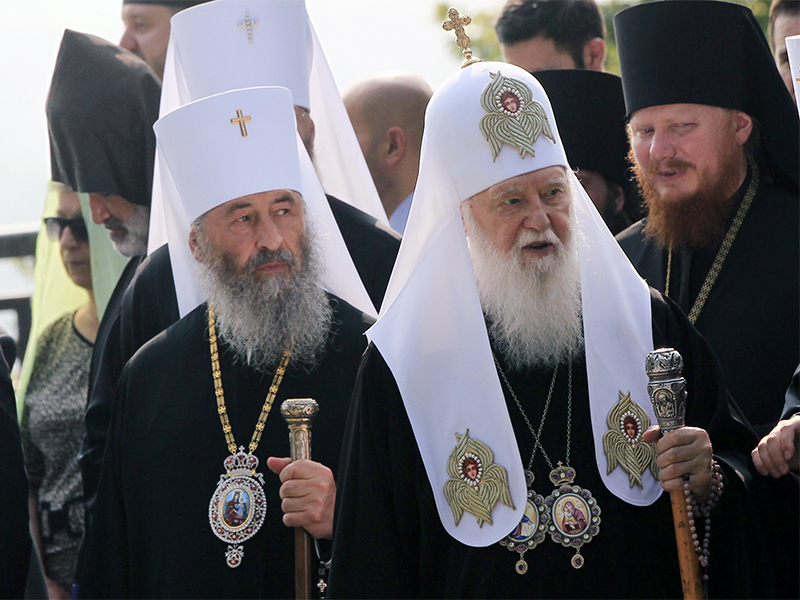 Leaders of the Moscow-backed church deny that Russia exerts political influence on them. “People go to church for prayers, not politics,” said Archbishop Kliment of the Moscow-backed Ukrainian Orthodox Church, who is based in Kiev. After much careful thinking, Lototskiy decided to stay with his flock and switch allegiance to the Kiev Patriarchate. It wasn’t a painless decision. Around 60 parishes have switched to the Kiev-centered church since 2014 in transfers the leadership of the Moscow patriarchate says were illegal. The Moscow Patriarchate has never recognized its Kievan rival, which formed amid a revival of Ukrainian nationalism after the fall of the Soviet Union in 1991. Nor has the preeminent Orthodox Christian leader, Ecumenical Patriarch Bartholomew of Constantinople, based in Istanbul. The absence of the Constantinople patriarch’s recognition is a major reason for parishioners and priests to stay within the Russian-affiliated Ukrainian Orthodox Church, according to Ivan Sydor, a Kiev Patriarchate priest. “I’m sure that many priests (in the Moscow-backed church) will move to the Kiev church the day after it gets recognition,” Sydor said. But the chances of getting recognition from the Constantinople patriarchate anytime soon aren’t high. The stakes in Ukraine are high. The two churches are vying for the souls of nearly 30 million people, according to recent surveys. It is hard to estimate which one actually has more parishioners. The Moscow-backed church has 12,300 parishes against the independent church’s 5,100 parishes. Some 40 percent of all Ukrainian Orthodox believers identified with the indigenous church in 2017, while 25 percent chose the Moscow Patriarchate, according to a joint survey by four Kiev-based pollsters. But the absence of results from Crimea and the war-torn territories in eastern Ukraine, where the Russian church is popular, probably distort the polls. One of the most striking examples of the rivalry came in January when a priest of the Moscow-backed church refused to conduct a burial ceremony for a child who was baptized in the Kiev Patriarchate church, despite the parents’ begging. The incident sparked a national scandal. Soon after, a Moscow Patriarchate church in the western Ukrainian city of Lviv burned down. Its priest blamed the arson on nationalist protesters who had picketed the church shortly before the blaze. 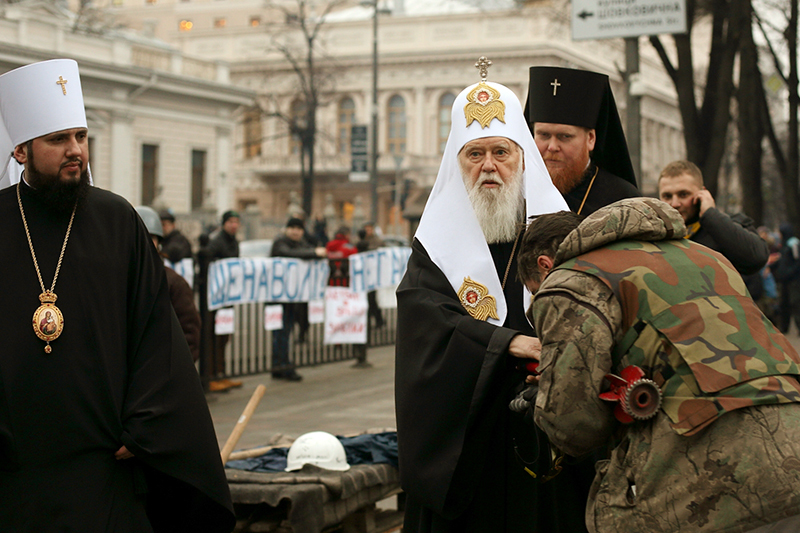 Around the same time, two protesters set a Moscow Patriarchate chapel in Kiev on fire. The protesters told Ukrainian media the attack wasn’t about religion but about “Russia stealing Ukraine’s history” since the chapel was standing on the historic site of an ancient church. Some parishioners are weary of the rivalry between the two churches. The polls show that about 31 percent of Ukrainians refuse to pick one of the churches, identifying simply as Eastern Orthodox. One of them is Ievgenii Gryban, a Kiev musician. He used to go to a church of the Kiev Patriarchate, but he grew sick of the priest talking politics from the pulpit. “He was saying smart things that I agree with, but I don’t think they belonged in a church,” Gryban said. He switched to a church allied with the Moscow Patriarchate. “I don’t think God cares if the church is of the Moscow or Kiev allegiance,” he said. Allegiances can shift, but Shawnie5 is still a snowflake. Apparently God is on Vladimir Putin’s side. Who would expect otherwise…Vlad is finest kind of Christian imaginable !! What would Emperor Constantine thing of this? His church is moving out of Constantinople to Moscow! Erdogan met with Putin today in Ankara. Putin will have his way. Putin will be supported by the church as were the Romanov’s. Politics and Religion are 2 sides of the same coin. Among believers, the rest mostly belong to the Ukrainian Greek Catholic Church, the Roman Catholic Church or various Protestant churches. The Ukrainian Greek Catholic Church is one of 24 particular churches that make up the Catholic Church. “You shall know them by how they hate each other.” That’s how you’re supposed to see true Christians. It’s in the Bible. God is definitely not on the side of Mr. Putin, who has banned religious freedom in his country, nor on the side of any other ruler on earth, including our own! That is because God’s kingdom, or heavenly government (Matthew 4:17), will soon put an end to and replace all human governments (Daniel 2:44), and rule in their place and stead (Isaiah 9:6,7; 11:1-5)! !